Two county lines drug dealers have been jailed for murdering a man in an attack with "brutality and ferocity". Peter Anderson, 46, died after being stabbed eight times when he went to buy drugs in Cambridge from Ashraf Hussan and Juned Ahmed on 25 July. 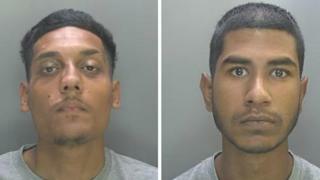 Hussan, 20, and Ahmed, 18, had denied murder but were sentenced to a minimum of 20 and 18 years respectively. The BBC previously revealed the knife police believe Hussan used was bought from a mail order website days before. The online store, based in a residential estate in Leighton Buzzard, is legal, but was criticised by the senior investigating officer in Mr Anderson's murder. Cambridge Crown Court heard that Ahmed, of Kings Road, Newham, was 17 at the time of the attack and had been a drugs runner for about a month for a "professionally run" county lines operation based in London, known as the RJ Line, in Cambridge. Judge David Farrell QC said that he was robbed of drugs and money on 24 July and the following day it was decided he bring Hussan as "a protector". Mr Anderson went to buy drugs ordered from the RJ Line at about 16:00 BST on 25 July on Stourbridge Common, but "what precisely happened then is only known by you two and Mr Anderson," said the judge. In a 999 call he made, Mr Anderson can be heard saying "I think someone just killed me". Ahmed's defence barrister claimed his client knew the victim "well". The judge said "the fact Mr Anderson did not know him" meant Hussan was the first to stab him, before Ahmed joined in in a "brutal and vicious knife attack intending to kill". Ahmed was sentenced to concurrent terms having previously admitted having a blade in public place and five drugs charges, including two of possession with intent to supply class A drugs. Hussan was also separately sentenced to concurrent terms after he admitted one charge of being concerned in the supply of class A drugs, and was also found guilty of having a blade. Two men, Alan Wakefield, 33, of Swaffham Road, Lode, and Sean Kimber, 41, of no fixed abode, were also given suspended 16-month and 18-month jail terms respectively for drug offences in relation to the case.